Family reunion! 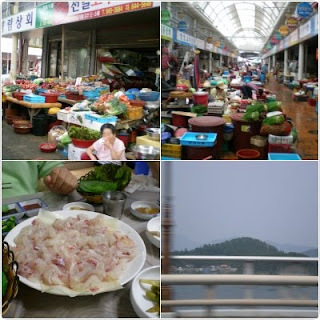 We went to Tongyoung, Kyungsang Namdo which is south-east part of Korea. It's not Busan. It was 2 hours away from Busan. 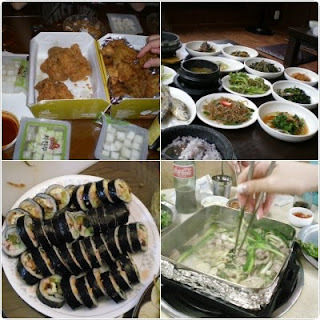 Tonyoung's local special product is Oyster and its soup and strew. Of course we had Oyster stew but didn't taste good enough comparing to regular oyster soup bob(I don't know what's called, 굴국밥; maybe it's called rice served in oyster soup) places in Seoul and any other places. But definitely sashimi was the greatest choice that we've chosen during the trip. 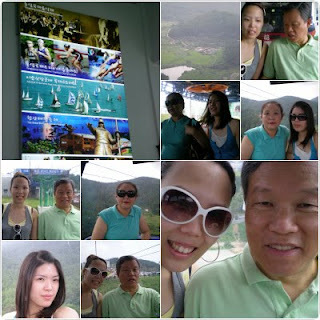 Oh, we took the cable car and climbed up to Miruk Mt. the view was quite good at the top, however, oh my goodness, I am acrophobia. -_-;;;;;;;;;; I just kept mumbling, "oh Lord, oh Lord" more than a hundred times and my family made fun of me. This is the only beginning.hahaha I will post videos about what I've bought and reviews of Korean cosmetics.^---------------------^ I already filmed. errrr I spent too much money but it's not worthless. I don't plan to come to visit Korea for next 2 or 3 years and some Korean producs are extremely expensive in the State. it was great to see and hang out with my old friend Eunjung and her wonderful cell members.